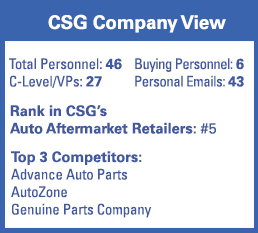 CSG Snapshot: O’Reilly Automotive, Inc.
O’Reilly year-over-year sales (FYE 12/31/15) increased 10% to $7.97 billion for 2015 and full-year comparable stores sales increased by 7.5%. The 205 new-store openings in 2015 met expectations. Plans call for an additional gain of 210 net units in 2016 across 38 states concentrating on Texas, Florida, the upper Great Lakes and New England. Estimated growth is based on a proprietary trend analysis. Actual figures are subject to change. This data is not intended for investment decisions.